Lovely shots on this discussion. Sitting here looking ay my own model parts and thinking: O.k. I need a similar sort of layout experience of my own, time to get cutting and gluing. Thank you for the continuous inspiration. Did I ever mention that I like trains? Doug, with my luck, the r/c Model TT would run off the layout and #$%^&*...Giles is a master, I am but a caveman blacksmith. Back to the wax works. I bet Neolithic man didn't say that when he invented the wheel!!! "wax which was used for lubricants, polish, and, yes, candles. Matter of fact, the snooty "new age" types still love the candles made from the plant to add "atmosphere" to their million dollar homes. Imagine what a cool model that would be! 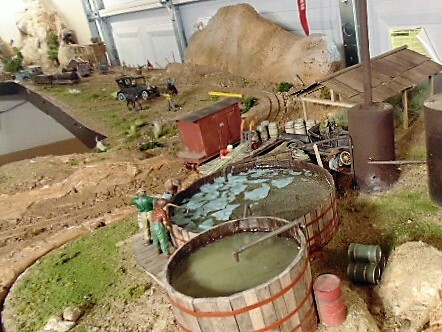 I may in fact build something like this for the layout." "I have been furiously working on something new...a wax factory. ...wax was used in lubricants, candles(duh! ), polishes, and...CHEWING GUM! It is still sought after today for scented candles sold to fru-fru upwardly mobile noveau-rich millennials and other such snoot in the air types." OK we've heard all the "wax". Lots of talk and Chewing gum? The wax factory as it is now...unfinished. 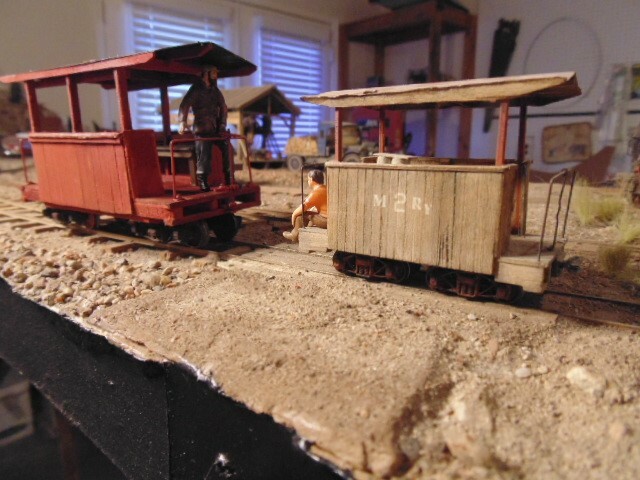 More info is available on the Silver City Narrow Gauge thread which I posted there not thinking at the time. Here's another view of the "Hairpin Curve" which is now the wax factory's location. The area in front of the horse & rider back to the hills beyond is "prime real estate". I have been "busy" with this n' that...here's something new however. While reading about rolling stock in the GILPIN ERA book, I became "interested" in the GT's little cabooses (cabeese?) and decided to build something similar. 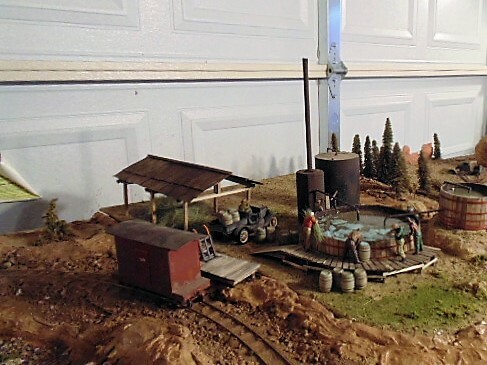 For more "inspiration", I sat at this here computer for a bit and while doing so, I ran my little Gilpin Tram On20 layout for a while. 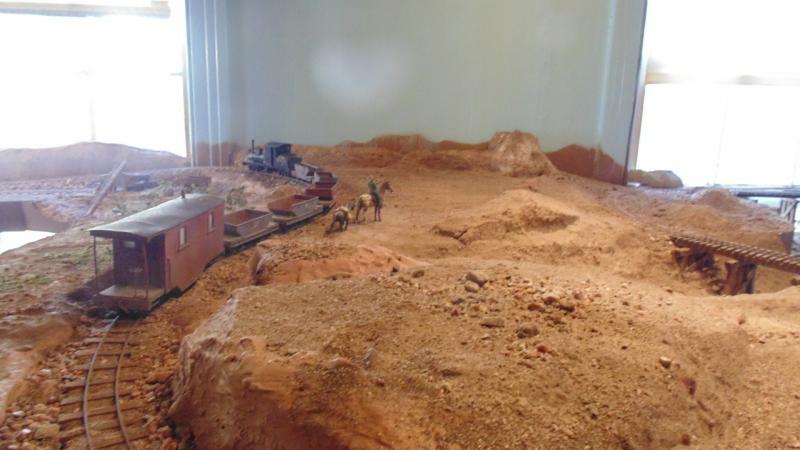 As I looked up to watch the tiny Shay and it's train of GT ore cars and tiny caboose...and there she was! Just exactly what I wanted to build, again. 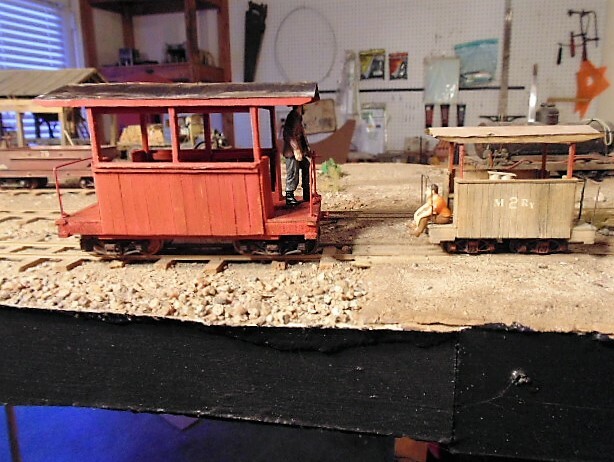 The little hack was built for my old On20 Mogollon Railway and is about 20 something years old. On the right is the original, complete with it's ancient Central Valley HOn3 (On20) sprung arch-bar trucks. At one time she had just 4 wheels but tended to bounce around (that's why they call em' bouncers) too much for me. And she still has the old M2Ry lettering. This little gal has more real miles on her than many real ones! I rolled this red job outta the shops. 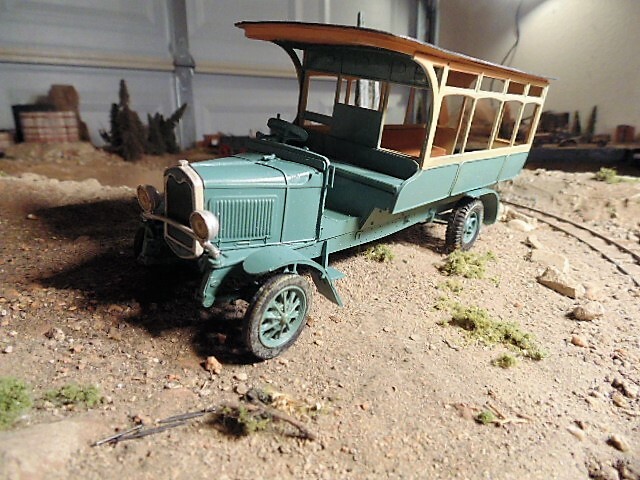 Built of basswood with an aircraft plywood frame and rolling on some old Grandt Line SR&RL trucks. The red paint is old also, Floquil lacquer "AT&SF Red" which looks like what I wanted. So there they are, the little one is over 20 and the big one is less than a week old. Now the little one can go back to work trailing her tiny train and the big one will be trailing ore cars from Terlingua to Boquillas. Beautiful furgones de cola, Woodie. Plenty of character and perfectly fitting the scene. Number 2 looks also beautiful. 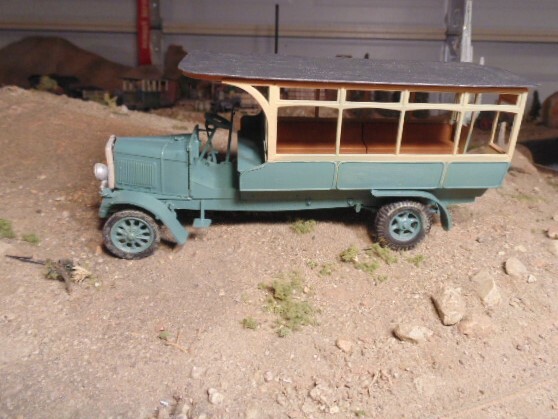 The Gila Tram, the tour bus line in the Big Bend, needed something larger to carry more tourists through the canyons and scenery of the bend. They had only an old REO touring car adapted with a larger roof and it could only carry maybe 7 or 8 folks...hardly a paying proposition. the Gila owners jumped into action and bought the non-running hunk of rusty metal, hauling it down to the "offices" in Terlingua. There the old curiosity was rebuilt and adapted to a life along the Rio Grande river. and some other parts of the Ford, the hood and radiator and the front wheels. which wouldn't give a good ride along the dirt and rocky roads in the park. Well, that's my little story about this machine. So, here she is with a nice new green and tan paint job, ready to haul some visitors from Terlingua down to Boquillas. And here is a wretched photo of the first "run" to the dusty little border town. A bit more "detail", maybe some seated tourists, some "stuff" lashed down on the roof, and the Tram's name on the side will be added as I see fit. 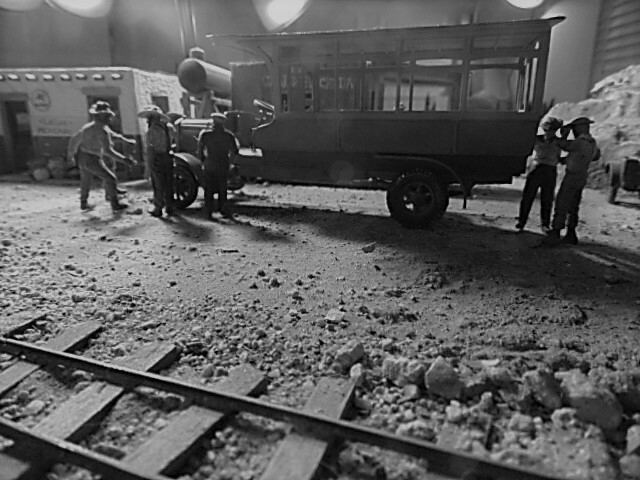 But now I have spent some time building this thing and full ore cars are waiting at the mines so back to work. rear wheels/tires from a 1:35 scale military 4 X 4 kit, and some razor saw work. The mix is a very good, interesting one and in this moment here Mr. Wallet hates you.